Kachinas are deified ancestral spirits who act as negotiators between humans and Gods. They bring rain and sunshine, help people solving personal problems and punish offenders.The Zuni, Hopi and Pueblo Indian tribes in Arizona and New Mexico hold ceremonial dances featuring men dressed to impersonate Kachinas. Dancers represent specific Kachinas, recognizable by their shape, masks body paint, attire and objects carried. It is believed that during the dance, the Kachina takes possession of the dancer. 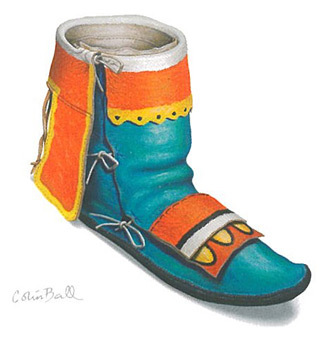 Above blue Kachina ankle boots are worn in hte Spring, for the butterfly dance ensuring bountiful crops.